The Maroo Nylon Design Series for the iPad 2 comes in some pretty wild skews from a graffiti wall to a retro cassette tape player. This series of cases is going to catch some eyes. A total a choice of 17 designs is found and there is something for everyone. This is a portfolio style iPad case or book style as some may refer to it. 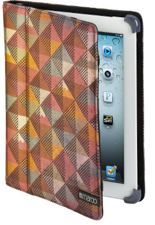 The exterior material on the front of the case where the artwork design is placed is made from a very durable nylon. The rest of the exterior is leather which feels very comfortable in the hands and the padding used underneath all this is exceptional. The stitching is precise, every stitch is perfectly inline and spaced. The overall build is superb. Inside the Maroo we find a felt lining which is in different colours depending on the style of case you choose. The felt stops your iPad from scratching, keeps the inside clean and helps with the overall build staying that bit more sturdy. On the left hand side on top of the felt a credit card holder is placed. Also on the left to that is an elastic strap which is there for holding the case up with your hand to demonstrate something to someone or to wrap around a car head rest for watching a film. On the right hand side the iPad is held in the very very clever skeleton shell. The skeleton is see through and allows the iPad to be put into the case within seconds and be removed in seconds. It keeps the iPad in a solid position and it won’t come accidentally out what ever you try and do. Im terms of functionality all ports, buttons and the camera are accessible because the sides are all wide open. Again the buttons are very very easy to access and use due to the skeleton design. The camera is also cut out but the speaker is a little comforted for my liking but the sound doesn’t seem to be affected which is surprising. To use the iPad within the case at different angles you have a semi loose flap of tight leather on the back which you tuck the side of the case which isn’t holding the iPad into. You have two angles to choose from. A 90 degree angle which is perfect for typing and another angle which is an upright position perfect for watching movies and TV Shows. Incorporated badly into the case is a magnetic lock which automatically puts your iPad to sleep when closed and wakes it when opened. This features needs to be far more solid and sturdy. Whenever I walk around with the case in my hand it flicks from being asleep to waking up and it becomes very annoying! The protection is kind of breath taking. I can drop my iPad 2 within the case onto a concrete floor from a distance of double my height and the iPad is fine along with the case. A lot of this is down to the skeleton shell where the iPad is held. It is also down to the amazing build quality from the leather, flet and the padding ect. Overall the Maroo Nylon Design Series for the iPad 2 is an outstanding case for traveling and just wandering around your house. The designs are going to get you noticed and there is something for everyone to choose. The iPad is very functional within, it feels really comfortable in the hands and it’s protection is unquestionable.